STEP 1: Finding a reference picture. I don't think I'll post a link for this tutorial, but if you like go check out my other Cheshire tutorials. 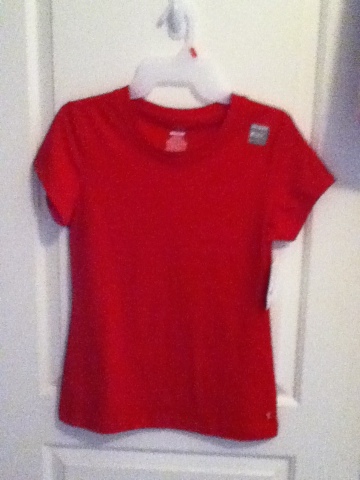 A red T-shirt, actually you can use any sort of red shirt. The only kind you can't use is one that is a button up I would also recommend that the shirt be a turtle neck so that it will be closer to what Cheshire wears than a shirt without that feature. I'll be using a scoop neck tee not a V neck. 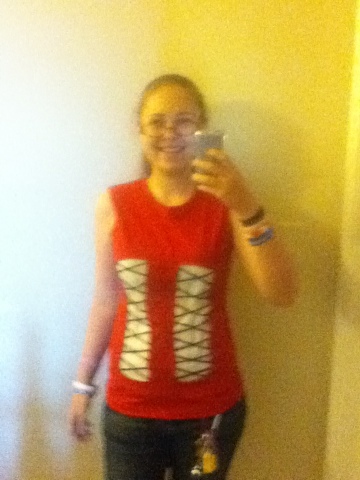 STEP 3: Take your shirt, if it has sleeves like mine then you'll need to cut them off. Make sure to leave at least an inch of the sleeve on so that you can hem it. Now that you've cut the sleeves off it's time to hem the shirt. What I did was fold the extra inch of fabric in along the seam of the existing sleeve then I sewed along the edge. STEP 4: If you take a close look at Cheshire's shirt you'll see that both the front and back have a sort of V shape to it. So to get that look, cut and hem a triangle shape into the bottom of the shirt. Make sure that the triangle is centered before cutting it out. :) This step is optional, you can do this but I didn't. 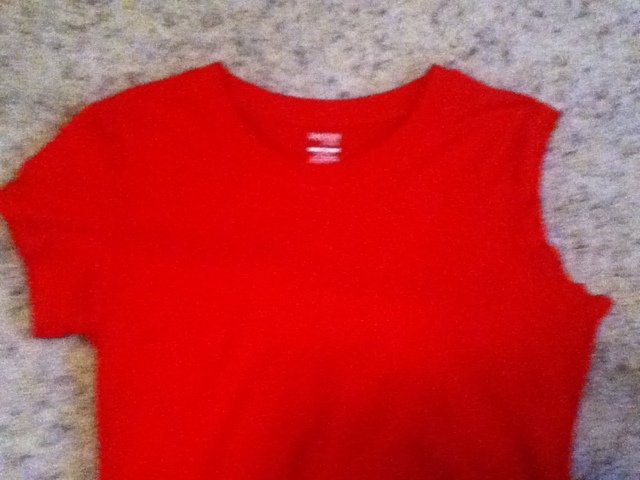 STEP 5: Fold your shirt so that the newly cut and hemmed sleeves are in front and back. The front of your shirt should be folded down the middle. 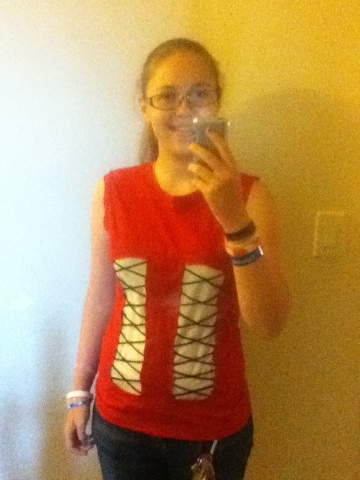 Before you start cutting you should probably make a pattern for the rectangles on the front of the shirt. The rectangle should be 2-4 inches wide, whatever is proportional to your body. :) Then about 20 inches long. 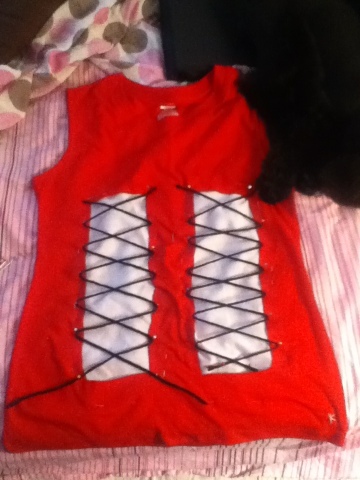 After drawing and cutting out your pattern pin it to the shirt and make sure that you center it before cutting. Now that you have your pattern centered and pinned it's time to cut it out! STEP 6: After you've cut out your rectangles take that same pattern and cut out two rectangles the same size plus an extra inch. Unfold your shirt and flip it inside out. Pin your white rectangles to the insides of the two rectanglular holes on the front of your shirt. Be sure not to sew right on the edge of the hole, leave enough space so that you can stick your finger underneath a flap of fabric on the outside. 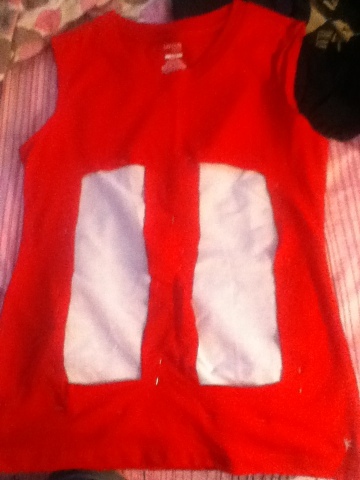 Now sew the rectangles to the inside of the shirt. Enjoy your completed Pandora Hearts Cheshire Cat shirt! ^w^ please stick around for more Cheshire tutorials! I won't be doing a pants tutorial though, for my cosplay I'll be using a pair of form fitting yoga or dance pants. The pants shouldn't cost more than 10-15 dollars if you're buying a pair of cheap yoga pants.